A new trailer has been released for Genesis: Alpha One, the unique game mixing roguelike, FPS, base-building and survival elements currently in development by German team Radiation Blue. The new trailer, which can be watched below, focuses on the planetary landing system. Once players have landed on a planet, they will be able to explore the surface and gather vital resources. Setting foot upon the dusty surface of a new unexplored planet, your crew of clones will begin to mine the planet for vital resources such as iron, iridium, aluminium and more. You’ll need to keep a watchful eye for any hostile alien lifeforms that inhabit the planet. 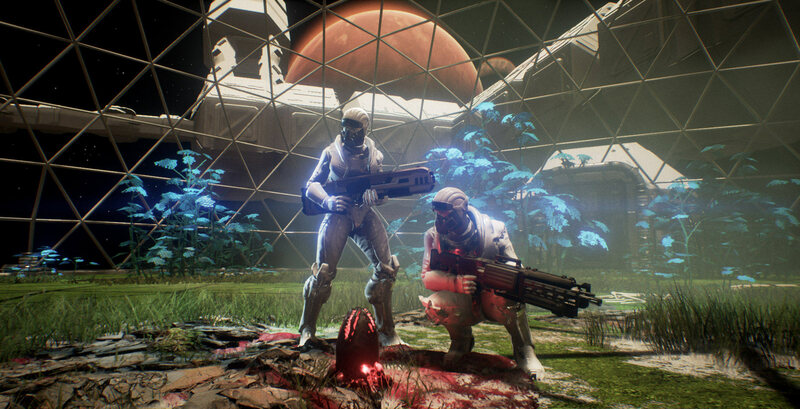 Defeating any threats will not only keep your crew safe but also enable you to collect biomass which will enable you to create new kinds of clones for your mission. Back in September, Chris had the chance to try out Genesis: Alpha One, and he was quite impressed. I have to reiterate that Genesis Alpha One is only in a very early alpha stage. Despite this, I was genuinely enthralled in the 30+ minutes I spent with the game. The build I played had some bugs and issues, but this is a game that shows such great promise and potential that I’d love to play it some more right now. As one of my top three games of EGX 2017, I simply can’t wait for it to be released next year. There’ll be no early access either, but only a full release on the PC, PS4 and Xbox one with a host of features that will keep you coming back for more. Genesis: Alpha One launches on PC, PlayStation 4 and Xbox One this year.